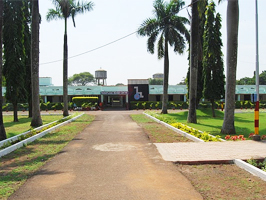 The Paraplegic Rehabilitation Center, Kirkee, Pune ( India) is a Rehabilitation Centre meant for the after care and rehabilitation of personnel’s of Defence forces of India who are medically boarded out i.e. retired form service due to Spinal Cord Injury while serving the Nation. The idea of building a Paraplegic Home (now named Paraplegic Rehabilitation Centre) was conceived after the 1971 Indo-Pak War when there were 60 Spinal Cord Injury casualties. The idea was based on already existing such Centre in USA (Veterans Home), UK (Spinal Cord Injury Centre Stokes Mandeville Ayelsbury) and other European countries. The initial planning was for a 24 bedded Centre and nineteen staff quarters. The foundation stone was laid by General(Late) GG Bewoor, PVSM, the then Chief of Army Staff on 23 June 1973 and the Centre was inaugurated by (Late) Shri Fakhruddin Ali Ahmed, the then President of India on 20 Sep 1974. By 1979, all the 24 seats were full with Paraplegic Ex-servicemen who had been invalided out of service and there were Paraplegics on waiting list for admission. Hence first phase expansion was carried out and thirty three beds were added making a total of 57 bedded Centre. At this stage it was realized that those paraplegics who are married want to stay with their families and therefore four especially designed married quarters were added. In 1988, four more married quarters were constructed. This increased the capacity to 65 bedded Centre. By 1990 all the 65 seats were fully occupied and paraplegics were on waiting list, hence the capacity was again increased to 83 single beds and 18 married quarters. Hence the Paraplegic Rehabilitation Centre had 83 single beds and 26 married quarters making a total of 109 bedded Centre. This makes Paraplegic Rehabilitation Centre the largest centre of its kind in India and one of the largest in South east Asia. Visit their Official Website here. Learn more about PRC, Pune, India, Anil's home since the past 26 years. Take me there ! You bowl, I hit !